Funny Meat Lover BACON MAGNET Kitchen Refrigerator Novelty Food Theme Gag Decoration--If BACON is wrong, I don't want to be Right--Hysterical fridge decor for guaranteed laughter. Crafts project scrapbook flat-back. 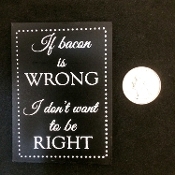 Funny Meat Lover BACON MAGNET Kitchen Refrigerator Novelty Food Theme Gag Decoration--If BACON is wrong, I don't want to be Right--Hysterical fridge decor will make you laugh out loud! Great stocking stuffer or fun gag for your favorite meat or bacon lover! Use as a gift wrap add-on to take the place of a decorative package bow. Can be used as Crafts flat-back glue-on decorations, too. Make into pins or add to photo frames or scrapbook pages! Size: approx. 3.5-inch (8.75cm) High x 2.5-inch (6.25cm) Wide x 1/8-inch thick.